Prof. Rosa Amoroso completed the degree in Pharmaceutical Chemistry and Technology and the PhD in Organic Chemistry at University of Bologna. Nowadays she is Associate Professor of Medicinal Chemistry at University of Chieti, Italy. The scientific interests of Prof. Rosa Amoroso are mainly directed towards medicinal chemistry and the research topics are compunds active on Peroxisome proliferator-activated receptors (PPAR) and Nitric Oxide Synthase (NOS). Hakan Arslan is an Professor of chemistry at Mersin University, Mersin, Turkey. He holds a B.S. degree in chemistry (1993) from Erciyes University, Kayseri, Turkey, an M.S. degree in chemistry (1995) from Erciyes University, and a Ph.D. degree in chemistry (1998) from Nigde University. Professor Arslan did his first postdoctoral research at the Department of Chemistry and Biochemistry, Georgia Institute of Technology, Atlanta, Ga, USA, and his second postdoctoral research at the Department of Natural Sciences, Fayetteville State University, Fayetteville, NC, USA. In addition, he has authored and coauthored more than 110+ technical papers in peer-reviewed journals. Arslan also made about 80+ presentations at various major national and international conferences. He is editor of European Journal of Chemistry. Moreover, he is also an Editorial Board Member of the Journal of Chemistry (HINDAWI), International Journal of Spectroscopy (HINDAWI), Heliyon (ELSEVIER), Rasayan Journal of Chemistry, E-Journal of New World Sciences Academy and Karbala International Journal of Modern Science. He also acts as a Referee for major international and national journals. His research interests include synthesis and characterization of redox active ligands, novel thiourea derivative compounds and N-heterocyclic carbene derivative ligands and their metal complexes, thermal behavior and decomposition kinetic studies, single crystal and powder X-ray diffraction studies, theoretical molecular spectroscopy, and vibrational spectroscopy. Simone Brogi got his “Laurea” in Biological Sciences in 2005. During his Master training, he started the studies in the field of molecular modelling. He obtained the Ph.D. degree in Pharmaceutical Sciences in 2010. Dr Brogi is a research fellow at the Department of Biotechnology, Chemistry and Pharmacy at University of Siena, Italy. Dr Brogi is the head of Molecular Modeling Unit in the research group directed by Prof. Giuseppe Campiani. The scientific production of Dr Brogi consists of over 60 papers published on international peer-reviewed journals, one patent and one book chapter (full list of publications: https://www.researchgate.net/profile/Simone_Brogi). Dr Brogi acts as reviewer for over 30 scientific journals and he is Associate Editor/Editorial Board member for several scientific journals. Dr. Stella Cascioferro graduated with an honors degree in pharmacy in 1999; she became a Ph.D. in Medicinal Chemistry from the University of Palermo in 2004. The same year, she joined the Physical and Theoretical Chemistry Laboratory, University of Oxford. Her research interests include the design, synthesis, and biological evaluation of heterocyclic compounds as antitumoral and antinfective agents. Currently she is working in the Department STEBICEF (University of Palermo, Italy). Dr. Stella Cascioferro is the author of 40 scientific papers published in the peer reviewed international journals and she also reviewed several journals in the field of medicinal chemistry. Dr. Kalász is employed bythe Department of Pharmacology and Pharmacotherapy, Semmelweis University, Budapest, Hungary. He hasexperience in the isolation of natural products, pharmacokinetics and metabolism. He worked at Yale University (New Haven, CT, USA and was a Visiting Professor in the Department of Pharmacology and Cell Biophysics, University of Cincinnati, Cincinnati, OH, USA. Dr. Kalász holds various ranks of editorial boards at Journal of Chromatographic Science, Acta Chromatographica, Journal of Planar Chromatography, Current Chromatography, Current Medicinal Chemistry, Letters in Drug Design & Discovery, Medicinal Chemistry, Mini-Reviews in Medicinal Chemistry, The Open Medicinal Chemistry Journal, LC-GC Europe, LC-GC Asia-Pacific. Associate Professor Ross McGeary obtained his PhD in organic chemistry from Monash University, Australia. After postdoctoral experience at Cambridge University and The University of Queensland, he took up a lectureship at The University of Queensland in 2002. He also holds a Masters degree in Technology Management. His current research interests are medicinal chemistry, particularly the design of inhibitors of metalloenzymes, and the development of new synthetic methodologies. Dr. Yoshio Okada obtained doctorate (Ph.D.) in Medicinal Chemistry from Kyoto University, Kyoto Japan in 1969. The title of the thesis is “Total synthesis of monkeyβ-melanocyte stimulating hormone”. He was a Professor of the Department of Medicinal Chemistry, Faculty of Pharmaceutical Sciences, Kobe Gakuin University, Kobe Japan for more than 30 years and now is a Professor emeritus of Kobe Gakuin University. He has published more than 240 scientific publications. 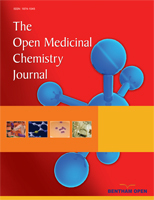 Dr. Okada is an editor of this journal (The Open Medicinal Chemistry) published by Bentham Scientific Publishers. Dr. Prokai-Tatrai is a Professor of Pharmaceutical Sciences at UNT System College of Pharmacy at Fort Worth where she is an award winning researcher and pharmacy educator. Her primary research interest has been on innovative and multidisciplinary projects focusing on medicinal chemistry-driven drug design and delivery into the central nervous system. A best testimony of a very recent success of her lab has been published in Science Translational Medicine describing the very first brain-selective delivery of estrogens based on a unique bioprecursor prodrug approach. She has six issued US patents and has been an editorial board member of numerous journals and an academic editor of a successful special issue on neuroprotection. Dr. Shailendra K. Saraf has done B. Pharm., M. Pharm., Ph.D., LL.B. He is a Professor of Pharmaceutical Chemistry and presently working as Director (Pharmacy), B.B.D.N.I.I.T., Lucknow, India. He has more than twenty six years of industrial, teaching and research experience. His major research interests include Synthetic Medicinal Chemistry, Phytopharmaceutical Chemistry and Nanochemistry. He has published more than 150 papers in national and international journals and conferences, and seventeen books/book chapters. He has delivered more than three dozen invited/plenary lectures and is a recipient of eight prestigious awards. Prof. Teruna Siahaan earned a B.S. and an M.S. from the University of Indonesia and a Ph.D. from the University of Arizona. Prof. Siahaan is currently affiliated with University of Kansas (Department of Pharmaceutical Chemistry), Lawrence, KS, USA. His research interests lie in the utilization and modulation of cell adhesion molecules on the cell surface for targeted drug delivery to a specific cell type and for enhancing drug permeation through the intestinal mucosa and blood-brain barrier (BBB). He has authored more than 180 scientific papers, and has earned many awards and honors, i.e. PhRMA Foundation Award in Excellence in Pharmaceutics, and Fellow of the American Association of Pharmaceutical Scientists (since 2002). CLAUDIU T. SUPURAN is full professor of medicinal chemistry at University of Florence, Italy (since 1994). He has published more than 1400 papers, several books, more than 70 book chapters and more than 20 patents. His Hirsch index is 125 and his publications were cited > 62600 times (Google Scholar). His main research interest is on carbonic anhydrase inhibitors, of which he discovered several new classes over the years. One of the sulfonamides discovered in his group completed Phase I clinical trials in 2014 for the treatment of advanced, metastatic solid tumors, being actually in Phase II trials. His laboratory is involved in drug design, synthesis, enzymology, molecular biology, computational and X-ray crystallographic studies of metalloenzyme inhibitors. Professor Leonard I. Wiebe, holds a PhD (Drug Metabolism) and a DSc (Radiopharmaceutical Sciences) from Sydney University, and Honorary Doctorates in Pharmaceutical Sciences from Meiji Pharmaceutical University (Tokyo) and Health Sciences University of Hokkaido. He is Professor Emeritus (Pharmacy) and Adjunct Professor (Oncology) at the University of Alberta. Dr. Wiebe was Alexander von Humboldt Foundation Science Ambassador to Canada (two terms), and was recently elected University of Saskatchewan Centennial Alumni of Influence. He has published over 300 peer reviewed papers and reviews, and holds several patents. Dr. Wiebe has consulted to numerous international organizations, including Volkswagen Foundation, Helmholtz Foundation, Cancer UK, ANSTO, and IAEA, and served on numerous academic panels internationally. He is a Board member for several scientific journals. Professor Wong obtained his PhD degree in Pharmacology from the University of Cambridge and conducted postdoctoral training at the University of California San Francisco. He is currently a Chair Professor of the Division of Life Science at the Hong Kong University of Science and Technology (HKUST). He also serves as the Director of the Biotechnology Research Institute and the Molecular Neuroscience Center at HKUST. As a highly accomplished researcher, Prof Wong has published over 200 scientific papers on the molecular pharmacology of G protein-coupled receptors. He also holds 6 patents. Prof. Feng Yang was associate researcher of Brookhaven national lab in USA after the phD in biophysics at graduate school of Chinese academy of sciences. Nowadays he is primary investigator of State Key Laboratory for the Chemistry and Molecular Engineering of Medicinal Resources. His research interests include design anticancer metal drug based on the protein structure, protein-based drug delivery systems, and multi-drug combination therapy of cancer. Prof. Feng Yang is the author of about 40 papers published in the peer reviewed international journals and he also reviewed several journals in the fields of medicinal chemistry. Dr. Janina Baranowska-Kortylewicz earned her M.Sc. from the Wrocław University of Technology (Politechnika Wrocławska) in Wrocław, Poland, and her doctorate from the University of Kentucky in Lexington, KY, USA. She continued her postgraduate research at the Albert B. Chandler Medical Center and Harvard Medical School. She is currently a professor at the University of Nebraska Medical Center. She also directs the UNMC Harry J. Bahr Radiolabeling Facility where under her supervision radioactive drugs and radioimmunoconjugates are prepared for clinical studies. The core of research activities of Dr. Baranowska-Kortylewicz’s laboratories is centered on the design, synthesis and evaluation of radioactive drugs for the targeted molecular radiotherapy and non-invasive diagnosis of cancer. Dr. J W Chern is presently associated with National Taiwan University, School of Pharmacy, Taipei. Dr. Chern’s research areas are Chemistry, Pharmacology, Toxicology, Pharmaceutics, Biochemistry, Genetics, Molecular Biology, Medicine, Chemical Engineering, Neuroscience, Agricultural, Biological and Materials Sciences. Dr. Chern has contributed more than 100 publications, having citations around 2271. Dr. Kietzmann is a graduate from the University of Greifswald, Germany. He has been a UNESCO fellowship recipient and spent postdoctoral studies at the University of Göttingen, Germany. He was a Professor of Biochemistry at the Faculty of Chemistry at the University of Kaiserslautern, Germany. His research interests include metabolism, hypoxia-dependent signal transduction processes reactive oxygen species (ROS) and regulation transcription factors and their role in tumorigenesis. He served as an evaluation expert for numerous organizations including the European Commission. He received several academic honors including a prestigeous award from the German Association for the Study of the Liver (GASL). Dr. Pal Perjesi, Ph.D., is currently affiliated with University of Pécs (Institute of Pharmaceutical Chemistry), Pécs, Hungary. His skills and expertise mainly lie in the subject areas of Cancer Biology, Chromatography, Apoptosis, Antioxidant Activity, Fluorescence, Antioxidants, Phytochemicals, Organic Chemistry, Reactive Oxygen Species, Oxidation, Free Radicals, Pharmacy, Oxidative Stress Biomarkers, etc. Dr. Perjesi, as an author/co-author, has published more than 85 articles in various journals, having over 1,245 total citations. Dr. Marc Poirot, Ph.D. is currently Head of the Department (Cholesterol Metabolism and Therapeutic Innovations in Oncology) at Cancer Research Center of Toulouse, University of Toulouse, Toulouse, France. His skills and expertise mainly lie in the subject areas of Cell Culture, Cell Biology, Cancer Biomarkers, Tumors, Cancer Research, Organic Chemistry, Pharmacology, Signaling Pathways, Stem Cell Biology, Enzymology, Medicinal Chemistry, Cell Differentiation, etc. Dr. Poirot, as an author/co-author, has published more than 80 articles in various journals, having a significant number of total citations, i.e. over 5,985. Dr. Trevor W. Stone, Ph.D., D.Sc., is currently affiliated with University of Glasgow (Institute of Biomedical & Life Sciences), Glasgow, UK. His skills and expertise mainly lie in the subject areas of Cell Signaling, Neuroscience, Neurobiology, Neurophysiology, Neurobiology and Brain Physiology, Electrophysiology, Physiology, Pharmacology, Neuropharmacology, Muscle Contraction, etc. Dr. Stone, as an author/co-author, has published more than 420 articles in various journals, having a highly significant number of total citations, i.e. over 13,695. Dr. Alain Gueiffier is presently associated with the University Francois-Rabelais Tours, INRA, Tours, France. Dr. Alain’s research interests include Chemistry, Pharmacology, Toxicology, Pharmaceutics Biochemistry, Genetics, Molecular Biology, Agricultural and Biological Sciences. Dr. Alain has contributed more than 109 publications, having citations around 2,432. Dr. Yoshihiro Ishikawa is presently associated with Cardiovascular Research Institute, Yokohama City University School of Medicine. Dr. Ishikawa’s research interests include Biochemistry, Genetics, Molecular Biology, Medicine, Pharmacology, Toxicology, Pharmaceutics, Neuroscience, Agricultural, Biological Sciences, Multidisciplinary and Materials Science. Dr. Claus Kerkhoff, Ph.D., is currently working as Full Professor in the Institute for Health Research and Education (School of Human Sciences, Division of Biomedical Sciences) at University of Osnabrück, Osnabrück, Germany. His specified fields of expertise include Role of S100A8/A9 in Epithelial Cells; Molecular Mechanisms of Gene Expression and Cellular Stress Response; Calcium- and lipid-binding proteins; Oxidative Stress; and, Molecular Mechanisms of Inflammation-associated Tumorigenesis. Dr. Kerkhoff, as an author/co-author, has published more than 60 articles in various journals, having a significant number of total citations, i.e. over 4,725. Dr. Bertho, Ph.D, is engineer of the French National Center of Research. He works in an interdisciplinary environment at Paris Descartes University, one of the main parisian medical university. Dr. Bertho was pioneering in France since 1993 in the field of ligand-based interaction studies by NMR in collaboration with several private companies and developed an automatic analysis of docking data (www.aupossom.com). Dr. Bertho manages the human health project 'MetaboParis-Sante' identified in the French metabolomic network (RFMF). He is working to promote NMR in a clinical setting for the first time in France and to create the national center of reference in metabolomics by NMR. Dr. Clemente Bretti graduated in Chemistry with first class honours in July 2003 at University of Messina, Italy. He attended research doctorate in Chemical Sciences “Analytical chemistry” in the three-year course (2004-2007) at the University of Messina. Since Dec 30, 2008, he is a fixed-term Technician in the Department of “Scienze Chimiche” at the University of Messina. His research is mainly focused on the study of thermodynamics of solutions with particular reference to: (a) Study of the acid-base behavior and of the sequestering ability of different ligands of biological and environmental interest, and (b) Solubility and dependence on ionic strength. Dr. Bretti is a co-author of 46 scientific publications in various international journals. Dr. Francesco Paolo Busardò obtained his Bachelor’s Degree with Honors in Medicine and Surgery at the University of Palermo (Italy); winning the Prize for the Best Thesis. He did his MSc in Forensic Toxicology from the University of Glasgow (Scotland) and a PhD in Forensic Science from “Sapienza” University of Rome (Italy). He currently works as forensic toxicologist in “Sapienza” University of Rome. He focused most of his research on γ-Hydroxybutyric acid (GHB) pharmacology, toxicology and analytical aspects, publishing more than 20 papers in this field. He is author of about 90 papers with I.F., with a total I.F. higher than 250 and h-index of 10. Dr. Eritja received his Ph. D. in Chemistry from the University of Barcelona, Spain. Currently he is Research Professor at the Institute for Advanced Chemistry of Catalonia of the Spanish National Research (CSIC) and member of the CIBER-BBN Networking Centre on Bioengineering, Biomaterials and Nanomedicine. He is coauthor of more than 300 publications and several patents on the synthesis and properties of nucleic acids derivatives. Dr. Laurent Désaubry was promoted CNRS research director (corresponds to full professor) in 2014, and also became professor at Tianjin University of Science and Technology (TUST), China, in 2015. He has published 70 articles and 7 patents. His current main research interests concern the development of prohibitin ligands, non-peptide prokineticin receptor 1 agonists and new synthetic methodologies in organic synthesis (website: http://desaubry.u-strasbg.fr/). Dr. Mayhoub (PharmD) had a PhD degree (2012) in Medicinal Chemistry from Purdue University, USA. He was a postdoctoral fellow at University of Michigan (2013) and currently he is a faculty at Al-Azhar University and Zewail City for Science and Technology (Egypt). His main contributions in the field of Medicinal Chemistry included development of several cancer chemopreventives, aromatase inhibitors, and antiflaviviral agents (Dengue virus, West-Nile virus and HCV). He discovered phenylthiazoles as a new antibacterial class of compounds for treatment of notorious bacterial strains MRSA and VRSA. Dr. Ion Niculescu-Duvaz graduated at the Politechnical Institute in Bucharest, obtained a Ph.D. in Organic Chemistry (Cytostatic Hormones) at the Chemistry University ,Timisoara, Romania. He was the head of Anticancer Drug Department at the Oncological Institute in Bucharest and then the Head of Biochemistry Dept. at the same Institute.He was a holder of an Eleanor Roosevelt fellowship and moved in 1992, as senior scientist at The Institute of Cancer Research, Sutton, UK. He was also visiting Professor at the Faculty of Chemistry, in Le Mans, France. He published142 scientific papers, 3 books, 13 chapters in monographies and authored 40 patents. Dr. George Perry earned his B.A. degree in Zoology from University of California, Santa Barbara and his Ph.D. in Marine Biology from Scripps Institution of Oceanography. He is currently affiliated with The University of Texas at San Antonio (Department of Biology, College of Sciences), San Antonio, TX, USA. Dr. Perry’s studies are focused on the mechanism of formation and physiological consequences of the cytopathology of Alzheimer. His current studies are based on role of redox active metals in mediating prooxidant and antioxidant properties, mechanism of phosphorylation control of oxidative damage to neurofilament proteins and mass spectrometry analysis of protein metal binding and crosslinking. He has published more than 1000 scientific papers in various journals. Dr. Khondaker Miraz Rahman is a Senior Lecturer in Medicinal Chemistry in the Institute of Pharmaceutical Science (IPS), King’s College London. His research activities are focused on the application of synthetic medicinal chemistry and chemical biology techniques to the design, synthesis and evaluation of novel drug-like chemical scaffolds as anti-cancer and anti-infective agents. He is an inventor of 6 patents and has more than 10 years’ research experience in medicinal chemistry and lead optimization in the anti-cancer and anti-infective areas. He has experience in both early- and late-stage drug discovery and translational research; co-founding Transcriptogen Ltd in 2013 and Femtogenix Ltd in 2015. Alessandro Serretti MD, PhD, Associate Professor of Psychiatry at Bologna University, Italy. Coordinator of a research unit active in clinical and genetic studies of major psychoses. Author of more than 500 scientific papers in peer reviewed journals, one textbook of psychiatry and over 600 presentations at meetings. H-Index of 77.Reviewer or member of the editorial board for 170 journals and funding agencies. Dr. Dianqing Sun is an Associate Professor of Pharmaceutical Sciences at the Daniel K. Inouye College of Pharmacy, University of Hawaii at Hilo. Before joining UH-Hilo, he was a Research Associate in the Department of Pharmaceutical Sciences of the College of Pharmacy, University of Tennessee Health Science Center. Dr. Sun received his Ph.D. from the University of Memphis, Organic Chemistry, and received his postdoctoral training in Medicinal Chemistry at the University of Tennessee. His Research is focused on the discovery and development of novel small molecule and natural product-inspired antibacterial, anticancer, and cancer chemopreventive agents, using classical organic synthesis and high-throughput chemistry approach, followed by traditional medicinal chemistry optimization of emerging lead compounds. Since 2002, associate Professor of Pharmaceutical Chemistry. The scientific activity, documented in 85 publications in international journals with high impact factors has been principally focused on the design and synthesis of small molecules as pharmacological tools and potential chemotherapeutic agents. She has a longstanding experience in the design and synthesis of heterocyclic compounds. The HIV represents her principle research interest but important results were recently achieved also in the anti-cytomegalovirus and anti-influenza fields, as well as derivatives as hepatitis C virus NS5B polymerase inhibitors. Other fields of interest are heterocyclic compounds as pump efflux inhibitors, and compounds active in Huntington disease. Prof. Joseph Trapani received his medical degree in 1977 and his Ph.D. in 1985 from The University of Melbourne and The Royal Melbourne Hospital respectively. Prof. Trapani is currently affiliated with Peter MacCallum Cancer Centre (Cancer Cell Death and Killer Cell Biology Laboratories), Victoria, Australia. In 2012, Prof. Trapani received a $6.8m award from the Wellcome Trust (UK) to lead a consortium of Australian and New Zealand research teams, aiming to develop a new class of immune-suppressive drugs that protect transplanted bone marrow stem cells against immune destruction mediated by the pore-forming protein, perforin. He has authored more than 230 research papers, reviews and book chapters on these topics. Dr. Williamson is an emeritus professor of medicinal chemistry at the University of Mississippi (UM), a former National Institutes of Health (NIH) branch chief, and research initiatives coordinator at the University of Dayton. At UM his research interests included treatments for tropical infectious diseases. In addition, he was the named program contact on more than 75 published funding opportunity announcements (RFAs & PAs), and worked on interagency collaborative programs with the NSF, FDA, USDA, and FTC. Currently, Williamson serves as a research initiative consultant for a number of academic and industrial institutions. Antonio Vassallo obtained his master degree with laude on Pharmacy in 2002. November 2005 he obtained his Specialization in Hospital Pharmacy with laude. 2010 he obtained his Ph.D. discussing a doctoral thesis “Identification of new potential inhibitors of Hsp90, a promising target in cancer therapy”. He spent in 2006 and 2009 a traineeship of seven months at the Molecular Oncology Laboratory of Sigma-Tau (Rome). Since 2010, Assistant Professor at the University of Basilicata. Research objectives: The main field of research deals with studies of biologically active compounds isolated from food and medicinal plants and their drug delivery systems. Dr. Ascoli is presently associated with George Mason University, Fairfax Campus, Center for Neural Informatics, Fairfax, United States. Dr. Ascoli’s subject areas are Neuroscience, Computer Science, Biochemistry, Genetics, Molecular Biology, Medicine, Agricultural and Biological Sciences, Mathematics, Psychology and Engineering. Dr. Ascoli has contributed more than 167 publications, having citations around 4428. Dr. J.B Chaires is presently associated with University of Louisville, Louisville, United States. Dr. Chaires’ subject areas are Biochemistry, Genetics, Molecular Biology, Chemistry, Pharmacology, Toxicology, Pharmaceutics, Chemical Engineering, Medicine, Materials Science, Agricultural and Biological Sciences, Immunology and Microbiology. He has contributed more than 190 publications, having citations around 14377. Dr. Copani is presently associated with Consiglio Nazionale delle Ricerche, Institute of Biostructure and Bioimaging, Rome, Italy. Dr. Copani’s research interests include Neuroscience, Biochemistry, Genetics, Molecular Biology, Pharmacology, Toxicology, Pharmaceutics, Medicine, Chemistry, Materials Science, Psychology, Agricultural and Biological Sciences and Chemical Engineering. Dr. Copani has contributed more than 100 publications having citations around 7519. Dr. Li-June Ming obtained his Ph.D. degree in 1988 from University of California at Los Angeles, USA. Dr. Ming is currently Professor in the Department of Chemistry (Institute for Biomolecular Science) at University of South Florida, Tampa, FL, USA. His research interests mainly involve Inorganic Chemistry (hydrolytic chemistry, metal-DNA chemistry, chemical modeling, metal-centered oxidative stress, detoxification of toxic phosphoesters, like pesticides and nerve agents, NMR of paramagnetic compounds) and Biochemistry (chemistry of Alzheimer disease-related metallo-β-amyloid, metalloproteins, metalloproteases, metalloantibiotics, peptides and proteins as “natural model systems”, Magnetic Resonance Spectroscopies). Dr. Ming, as an author/co-author, has published more than 70 articles in various journals, having over 2,165 total citations. Dr. Bernard F. Pirotte is currently affiliated with University of Liege (Department of Medicinal Chemistry, Pharmaceutical Chemistry Laboratory), Liege, Belgium. His skills and expertise mainly lie in the subject areas of Organic Synthesis, Synthetic Organic Chemistry, Medicinal and Pharmaceutical Chemistry, Heterocyclic Chemistry, Drug Discovery, Pharmacology, Molecular Modeling, Synthetic Medicinal Chemistry, Heterocyclic Compounds Synthesis, etc. Dr. Pirotte, as an author/co-author, has published more than 195 articles in various journals, having a significant number of total citations, i.e. over 3,470. Dr. Joseph Sebastian, M.S., Ph.D., F.A.C.B., is Technical Director in the Department of Infectious Diseases at the Center for Molecular Biology and Pathology (CMBP), Laboratory Corporation of America, Research Triangle Park, NC, USA. His skills and expertise mainly lie in the subject areas of Immunology, Microbiology, Pharmacology, Toxicology, Pharmaceutics, etc. Dr. Sebastian, as an author/co-author, has published many articles in various national / international prestigious journals. Dr. Victor J Hurby is presently associated with University of Arizona, Department of Chemistry and Biochemistry, Tucson, United States. Dr. Hurby’s research interests include Biochemistry, Genetics, Molecular Biology, Pharmacology, Toxicology, Pharmaceutics, Chemistry, Neuroscience, Medicine, Chemical Engineering and Materials Science. Dr. Hurby has contributed more than 965 publications, having citations around 34,776. Dr. Michael Kassiou obtained his Ph.D. degree (in 1992) in Organic Chemistry from University of New South Wales, Kensington, Australia. Dr. Kassiou is currently Professor of Medicinal Chemistry and Academic Director of Drug Discovery Initiative at The University of Sydney, Sydney, Australia. His research interests mainly involve Medicinal Chemistry and Drug Discovery; Structure-activity relationships of CNS bioactive molecules; Rationale CNS drug design and evaluation; and, Heterocyclic Chemistry. Dr. Kassiou, as an author/co-author, has published more than 235 articles in various journals, having a significant number of total citations, i.e. over 5,215. Dr. Gregory P. Kouraklis is currently affiliated with University of Athens (Second Department of Propaedeutic Surgery, School of Medicine), Athens, Greece. His skills and expertise mainly lie in the subject areas/fields of Biochemistry, Immunochemistry, Molecular Biology, Biotechnology, Bioinformatics, Cell Biology, Cancer Research, Evolutionary Biology, etc. Dr. Kouraklis, as an author/co-author, has published more than 275 articles in various journals, having a significant number of total citations, i.e. over 4,460. Dr Che Azurahanim Che Abdullah @ Dr CACA is currently a senior lecturer in Faculty of Science Universiti Putra Malaysia. Due to her multidisciplinary expertise, she has strong links with both local and international research collaborators including her PhD supervisor Dr Richard Sear at University of Surrey, material science expert Professor Alan Dalton at University of Sussex and Professor Ray Baughman group at Alan G. MacDiarmid NanoTech Institute, University of Texas at Dallas, USA. For ADMET and Toxicology she learned from Dr Nick Plant from Centre for Toxicology, Faculty of Health and Medical Sciences. She gained in depth knowledge related to using Atomic Force Microscopy (AFM) and immunofluorescence. She collaborates with Associate Professor Yuki Shirosaki at Kyushu Institute of Technology (Kyutech) Japan for biomaterials related research. Currently within UPM she collaborates with Associate Prof Dr Latifah Saiful Yazan from Faculty of Health and Medical Sciences, Dr Mas Jaffri Masaruddin in Faculty of Biotechnology, Prof Dr Robiah Yunus and Associate Prof Dr Suraya Abdul Rashid from Chemical Engineering and within Faculty of Science she works closely with Dr Hafiz from Biology and team up with Professor Basyaruddin Abdul Rahman, Dr Janet Lim, Dr Haslina, and Dr Norizah from Chemistry department. She also actively collaborates with USM (Dr Iskandar and Dr Wan Amir) for in vivo study of nanoformulation for colon cancer and obesity, UKM (Dr Farina Yazid) for dental materials and UITM (Dr Mohd Zaki Mohd Yusoff) for nanoporous ZnO. Dr. Osama M. Ahmed was granted Ph.D. (in 2000) in Physiology from Faculty of Science, Cairo University, Egypt. Dr. Ahmed is a professor of physiology at Faculty of Science, Beni-Suef University and Faculty of Oral and Dental Medicine, Nahda University, Beni-Suef, Egypt. His research interests are as follows: stem cell research, diabetes mellitus, maternal hypothyroidism and hyperthyroidism effects on fetuses and offspring, obesity, carcinogenesis, drug-induced toxicity, rheumatoid arthritis, hyperoxaluria, hyperhomocysteinemia, and assessment of medicinal plant and their constituents as well as novel synthetic organic compounds as protective, preventive and therapeutic remedies. He has authored/co-authored more than 90 publications, and has also written two book chapters. Dr. Rajesh Kumar Singh received his Bachelor (2003) and Master degree (2005) in Pharmacy from Panjab University, Chandigarh. He completed his PhD (2008-2013) in Pharmaceutical Chemistry from Punjab Technical University, Jalandhar, and is in teaching profession since 2003. Dr. Singh’s major area of research interests include drug-design, polymer-drug conjugates, CNS active therapeutic agents and green chemistry approaches for chemical synthesis. He has to his credit more than 40 Research Papers, 46 Conference Abstracts, 1 Book and 6 Best Paper Awards. He is currently Editorial Board Member of 04 International Journals, has reviewed more than 40 International papers and got 6 research grants funded by government agencies. Dr. Nafees has joined MONASH University Malaysia (MUM) in September 2012. He obtained M.S. (Pharm) and PhD in Natural Products chemistry/Medicinal Chemistry from National Institute of Pharmaceutical Education and Research (NIPER), Mohali, India. He worked on total synthesis of natural products, synthesis of new chemical analogues for discovery of new anti-HIV agents based on natural products templates. Before joining MUM as lecturer, he was a Postdoctoral Research Fellow in Department of Medicinal Chemistry, School of Pharmaceutical Sciences, Universiti Sains Malaysia (USM) Penang. His current areas are computational based rational design of new drug candidates for HIV-1, dengue and other therapeutics. Dr. S.A.M. Hussein completed her B.Sc. Chemistry in 1982. She further got Master degree in 1991. Her PhD focuses on isolation of the phenolic from Plants. She has a very vast professional background. She was the head of NMR department at King Saud University in 2002 and she also received professor degree in 2004. She was the editor of the Egyptian journal of Chemistry. She has contributed 50 publications, having citations around 1,231. Dr. Jean-d’Amour K. Twibanire received his Ph.D. (2013) in Chemistry from Dalhousie University, Halifax, Canada. He was awarded the prestigious Natural Sciences and Engineering Research Council of Canada (NSERC) Postdoctoral Fellowship, which he held at CanAm Bioresearch Inc. in Winnipeg, Canada, focusing mainly on Medicinal Chemistry. He has published several papers in International Chemistry Journals and has also published outside of chemistry, for example “The United Nations Security Council: Imbalance of Power and the Need for Reform” was published in The International Journal of Political Science and Diplomacy, which is open access. Currently, Dr. Twibanire is with CanAm Bioresearch Inc. in Winnipeg, Canada, as a Research Scientist and Investigator.